The key to making great grilled pork chops is to purchase a thicker cut of meat in order to prevent them from drying out on the grill. Thin pork chops have the tendency to quickly dry out on the grill, while thicker cuts seal in the juices toward the center of the meat. Try to find a pork chop thicker than 1/2 inch and try to avoid buying a bulk package of thin pork chops. Also, marinating the pork in barbeque sauce before putting it on the grill will help lock in the moisture during the grilling process. Try this simple recipe for a delicious and juicy pork chop that is sure to be a crowd pleaser. Poke your pork chops with a fork to add small holes all over the outside of the chop. This will help to tenderize and make sure the marinate seeps into the skin. Place your pork chops in a large mixing bowl or zip-lock bag and add seasoning and BBQ sauce to marinate. Marinate in the refrigerator for 2 to 12 hours, the longer the better. Start your grill and turn it to medium-high heat if you are using a gas grill. Place your pork chops directly over the hot flame on the grill. 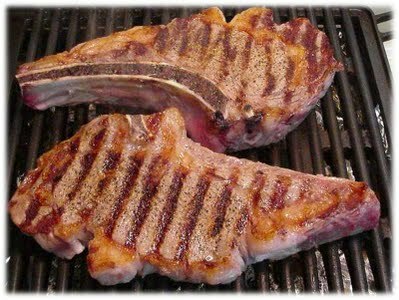 You will cook each side of the chops about 6 minutes, turning a quarter of a turn half way through cooking on each side. Your chops should have a nice char effect from the hot flame and the BBQ sauce marinate. It will take about 12-13 minutes to cook pork chops using this recipe. This recipe calls for a little thicker cut of pork chop at 3/4 inch thick, which will prevent it from drying out on your grill. If you are using a meat thermometer, you are trying to achieve 155 degrees in the center of your pork chop.